As anyone living in Los Angeles knows, changing diets is a very popular activity. Your holiday guest might have decided they don’t want anything to do with gluten. They might also have an aversion to seafood. Perhaps they’ve given up coffee in exchange for fresh brewed tea. These are all the little dietary details you should know before your guests arrive. That way you can plan your meals and have the right snacks waiting for them. Everyone who travels knows enough to bring their own toothpaste and toothbrush. But many people get into the habit of having hotels provide them with soap, shampoo and conditioner. You can take care of that as well by buying travel size bottles of shampoo and lotion. Set them out in a nice wicker basket along with fresh bar soap and clean towels. It’ll be as if they’ve checked into a four-star hotel! If this is the first time that your guests are coming to Los Angeles, then there’s a lot they want to check out. You might not be able to go with them but you can certainly provide them with a fun adventure itinerary. It might even be smart to make sure they have an Uber account. You can always set up their Uber so that your pain with your account. That way you won’t have to worry about them getting lost. You want to make sure that the bed your guests are sleeping in is situated with fresh linens, fluffy pillows and blankets. If it’s been a while since the comforter has been clean, then you might want to drop it off at the dry cleaner. 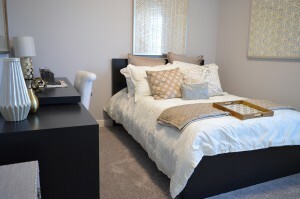 It would also be helpful to make sure all the clutter is removed from the guest room. You don’t want them to feel like they’re sleeping in a storage locker. That’s where hiring Junk King Los Angeles can make a huge difference. As you get your house clean for your guests, you may notice a bunch of things that should be tossed out. The team from Junk King Los Angeles can sweep in and remove any object regardless of weight or size. You’ll be amazed how quickly they can make your junk disappear. Your holiday guests will feel welcome in a home that doesn’t have any clutter or junk. One call to Junk King Los Angeles gets it done. This entry was posted in LA Junk Removal and tagged holiday guests, junk king, junk removal on November 27, 2017 by Junk King. Last updated November 27, 2017 .